Voice: You know what they say sir, never ascribe to malice what can be adequately explained by stupidity. Man: If it's not deliberate, why do your billing errors always increase my bill? Why don't they ever decrease it? 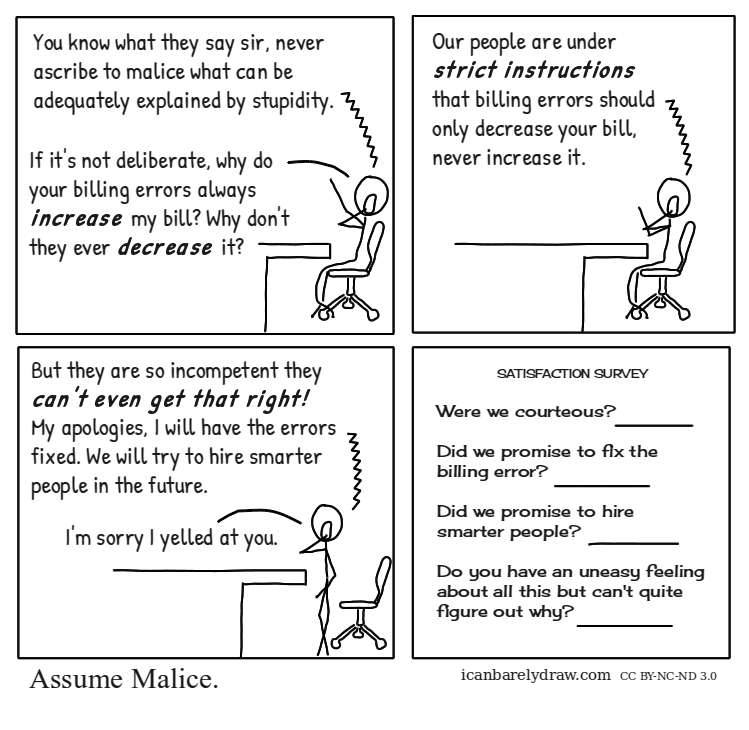 Voice: Our people are under strict instructions that billing errors should only decrease your bill, never increase it. Voice: But they are so incompetent they can't even get that right! My apologies, I will have the errors fixed. We will try to hire smarter people in the future. Man: I'm sorry I yelled at you. Did we promise to fix the billing error? Did we promise to hire smarter people? Do you have an uneasy feeling about all this but can't quite figure out why?